Rome, Naples, New York…Streatham?! Ok, maybe the south London suburb isn’t quite ready to join the ranks of the world’s great homes of pizza just yet, but the arrival of Bravi Ragazzi has certainly helped put it on the map. Like all good local gems, Bravi Ragazzi is easy to miss. Tucked away just off the High Road, this little pizzeria might not at first glance look like much, but if you can negotiate a spot at one of its handful of tables you are in for a treat. Bravi Ragazzi prides itself on being “a new generation of Neapolitan pizza”, and this is certainly reflected in their menu. Along with the classics you would expect from a traditional Neapolitan outfit, there are a few more adventurous options available such as the Mimosa (cooked ham, double cream, sweetcorn) and the Tunarella (tuna, red onion, black olives). Whatever you choose you can be sure your pizza has been prepared in the grand tradition of obsessive attention to detail and quality that has defined great Neapolitan style pizza for centuries. On our visit we went for a mix of old and new. 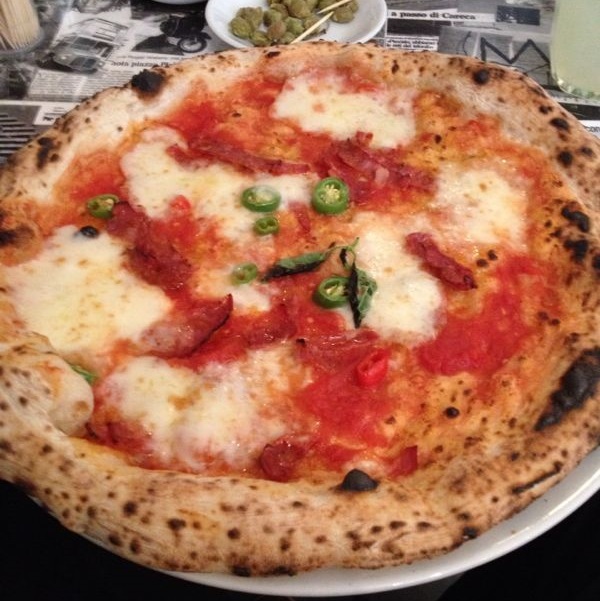 The Diavola was a simple, classic combination of delicious, meaty salami and fresh chilli, while the Maradona featured fennely Italian sausage – more commonly found on ‘white’ pizzas – on a tomato base with sweet peppers, black olives and capers. This is a great example of how Bravi Ragazzi puts its own spin on traditional Neapolitan combinations of ingredients, with great results. We also ordered two of the signature Bravi Ragazzi pizzas which, divided into quarters, is the restaurant’s answer to the Four Seasons and features the toppings from the Diavola, Mimosa, Crudo e Rucola (rocket, parma ham, parmesan) and Capriciosa (mushroom, cooked ham, salami, olives, artichoke). The incredibly friendly staff were also more than happy to replace the Mimosa section on one with the Provolina’s smoked cheese and cherry tomatoes. The bases of all four pizzas were top-notch Neapolitan specimens: light and chewy with just the right amount of charring to add the final touch of flavour. With its traditional values and novel (but not radical) flavour combinations, Bravi Ragazzi is really the standout pizzeria in the surrounding area and a welcome addition to the local restaurant scene. We would certainly say it’s worth the journey, even if you live further afield, and for those that can’t face wandering down, the good news is they deliver as well! This pizza looks very delicious. Next week I am going to South London. 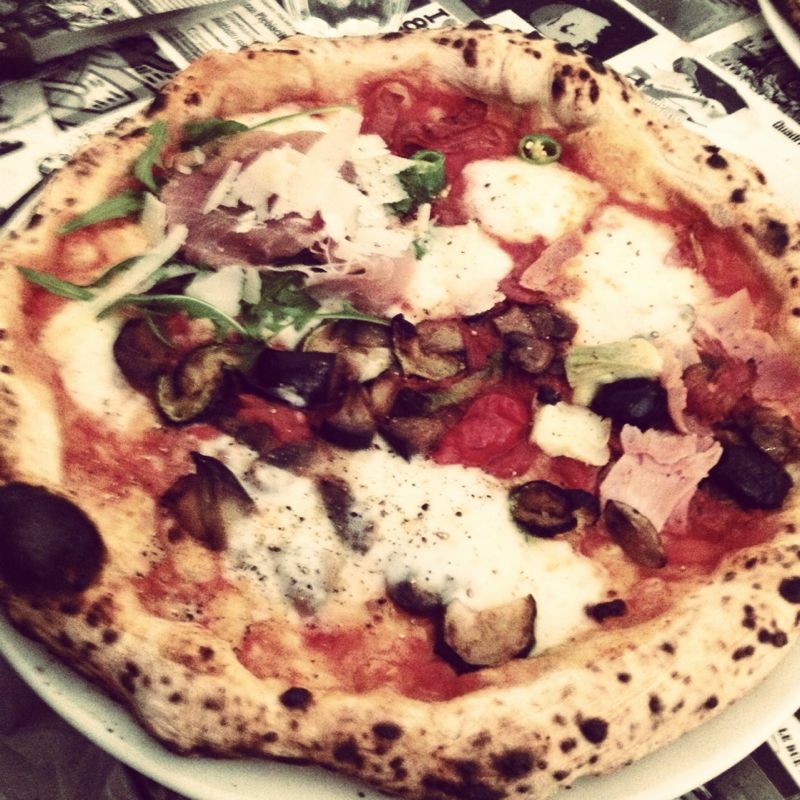 I will definitely visit Bravi Ragazzi and try their wood fired pizza.